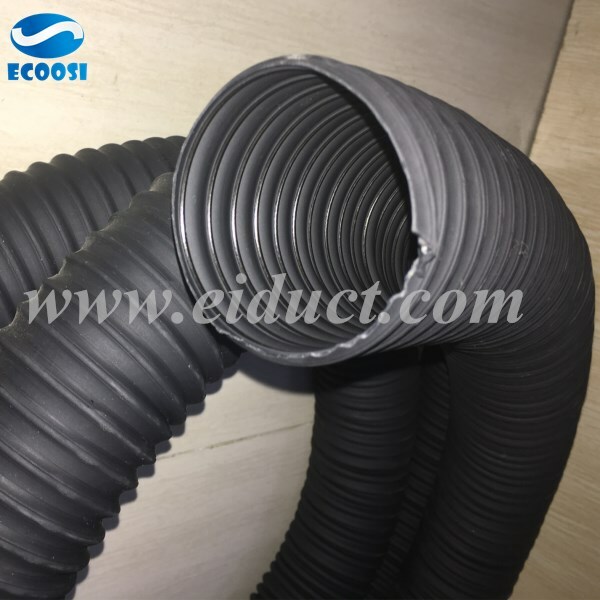 Ecoosi flexible ducting hose - Thermoplastic Rubber Ducting hose is a lightweight rubber duct hose that is recommended for light-duty air and fume applications. Our thermoplastic rubber hose is made from thermoplastic rubber reinforced with a spring steel wire helix. Thermoplastic rubber is a class of copolymer that possess both thermoplastic and elastomer properties, generally made from a mix of plastic and rubber. 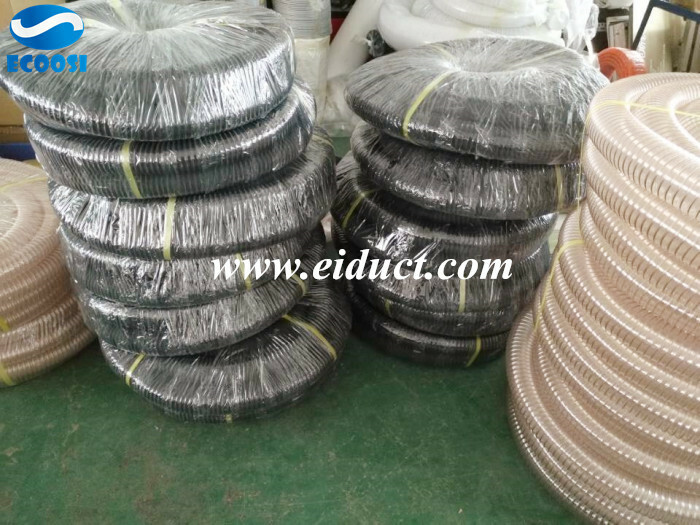 Its thermoplastic rubber material gives this hose great chemical resistance and also provides a longer life in extreme hot and cold environments over standard rubber. Its thermoplastic composition also provides excellent moisture, UV, and ozone protection to this chemical resistant hose. 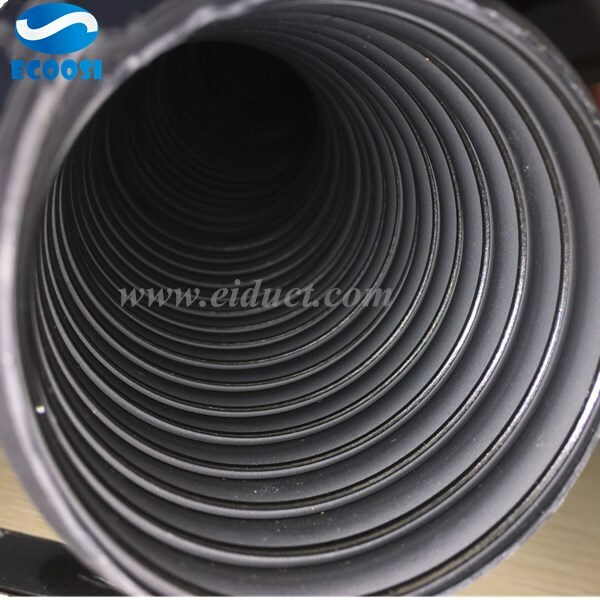 Since thermoplastic rubber hose fares well in both extreme hot and cold environments, the chemical resistant hose is often preferred over the use of other rubber duct hoses. 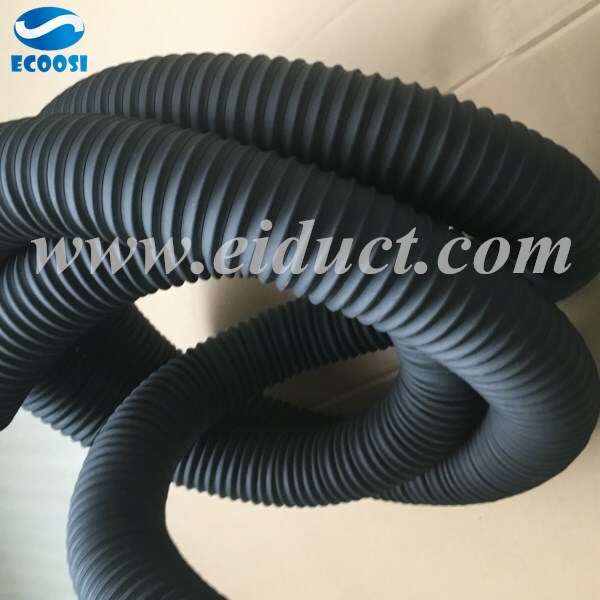 This lightweight and flexible rubber duct hose is reinforced with a spring steel wire helix that serves to provide protection and durability for the hose. It is generally recommended for light duty applications involving both dust and fumes. 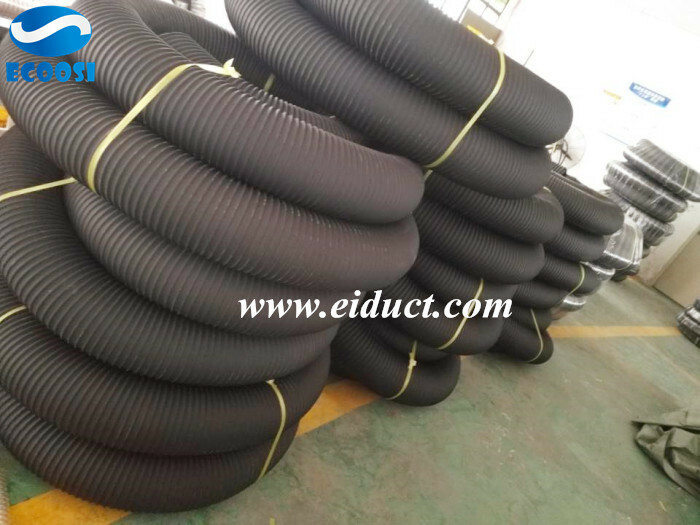 Unlike other ducting materials, the Thermoplastic Rubber Ducting hose operates at both high and low temperatures. 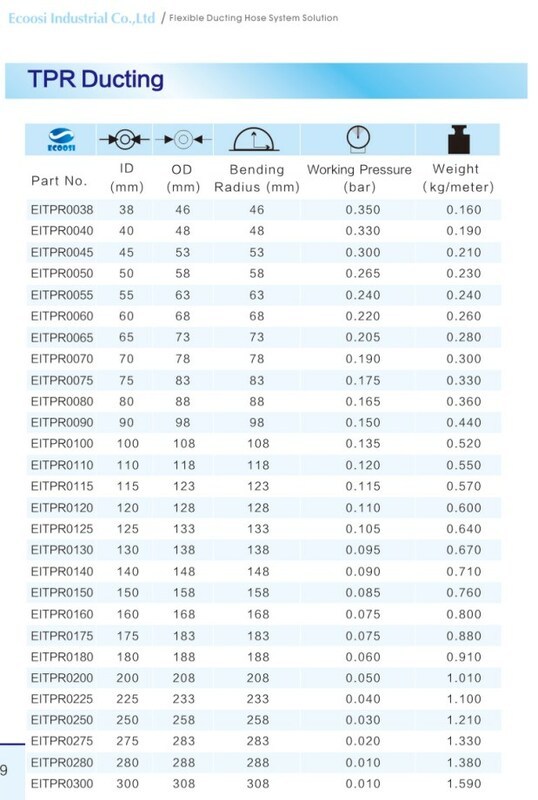 The thermoplastic rubber hose features a temperature range of -40 degrees Celsius to 150 degrees Celsius and is intended for use in situations where the material will be exposed to wide temperature ranges. 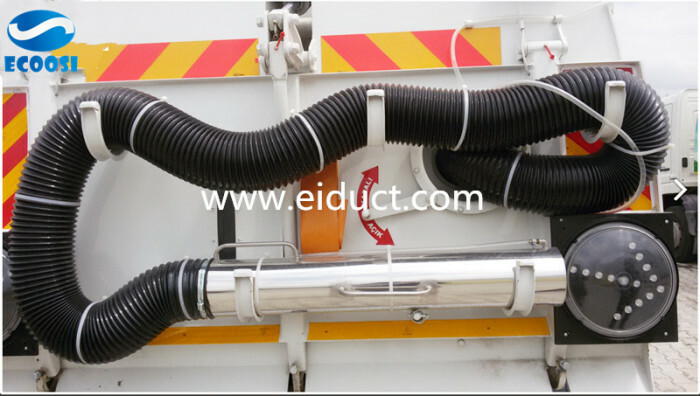 Additionally, its lightweight construction of this hose makes it extremely flexible, allowing for easy storage and installation in tight spaces. 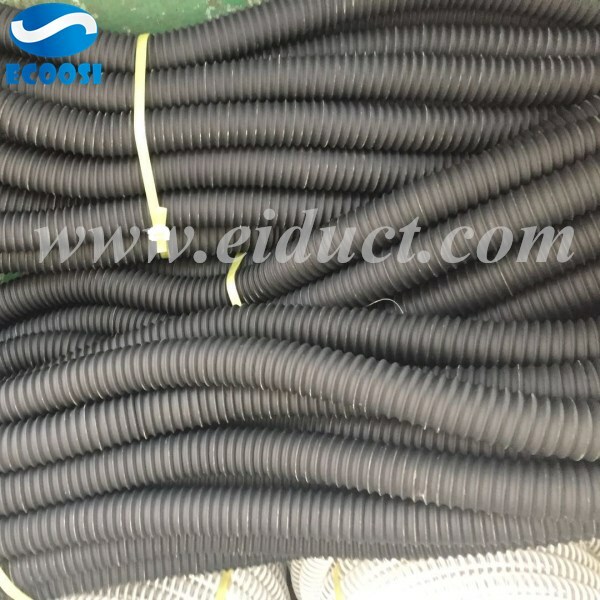 Ecoosi's Thermoplastic Rubber Ducting Hose comes in a standard length of 10 meters with plain cut ends and a black finish. 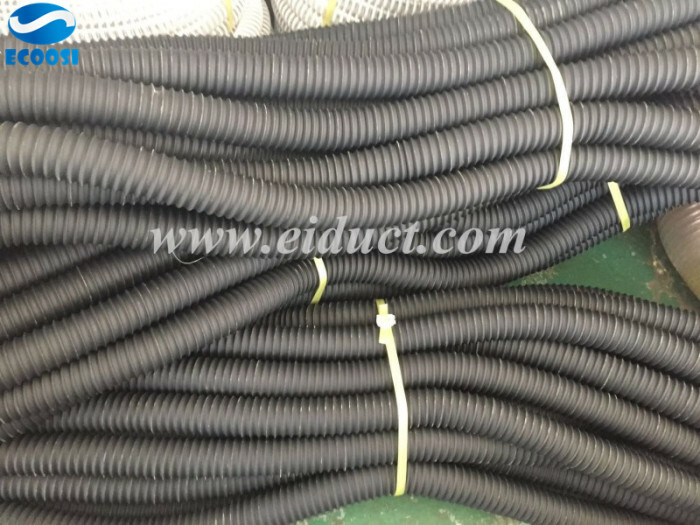 Internal diameter sizes for this flexible rubber duct hose range from 25 mm to 305 mm. Its lightweight makeup of this hose makes it ideal for light duty air, dust, and fume applications such as A/C ventilation, electric panel cooling, stereo speakers, heater/defroster hose, and textile mills.